Many of you requested a tutorial for my pillowcase grocery bags. They are super easy and quick to make, involving only straight line sewing. The straps actually take a bit more time than the bag itself, but still easy enough. Hopefully these instructions are easy to follow. –About one hour of time and some good music. Turn pillowcase inside-out and fold in half long-ways. Cut a 3-4 inch strip off of one side. Save the long strip for the straps. Open and lay flat. Pin together the open sides. 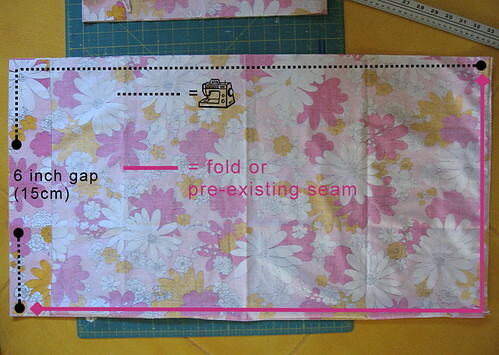 You will be sewing this together in the following manner, leaving a 6 inch (15cm) gap in the center. Cut a 2 inch square (a) off of all four corners (b) making sure to measure from the folded edge and and seam, not the rough edge. Following THESE instructions, you are going to square off each corner (c). When all four corners are sewn, flip the bag right side out through the open gap and sew the gap closed (hand or machine– I used my machine for this). Now you will have a completely sewn shut, empty pillowcase with squared off corners. Now the fun (and kinda hard to explain) part… Fold the pillowcase into itself by stuffing the just sewn together gap-end into the bottom of the opposite end. The sewn together gap-end will be the inside bottom of your bag(d) and the squared-off corners will meet together on each side(e). Does this make any sense at all? There are many ways to make straps, this is just how I do it. I just don’t like sewing all around the edges of a skinny strap and then try to turn it right side out of a little hole on the end. Cut off the big hemmed end off of the remaining strip. 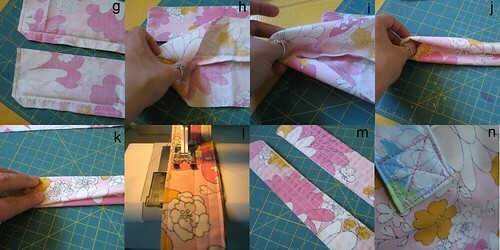 Fold the strip in half long-ways and cut again. These will be your two straps. They should be 12-16inches long each. With the right sides facing in, sew together the short ends of each strap, leaving one long side open. Trim the corners(g) and turn right-side out. 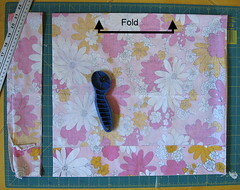 Following the picture above, fold the ends towards the inside so that the raw edges are tucked inside(h-j). Once it is straight and flat(k), press with an iron and sew together(l-m). Lastly, sew one strap to each side of your bag with big criss-cross squares(n) and you are done!!! Now, my editor (Mr Creative Kismet, who really isn’t very creative as far as sewing is concerned, but did major in english lit) said “um, this sounds good and seems to make sense?”. What he was really trying to say was that he hasn’t a clue if this sounds right. SO, if any of you sewing buddies of mine out there in blog land think I need to tweek anything on this, please shout out, because I did use some of my own terminology which may, or may not, be helpful in this tutorial. Thanks! This entry was posted in Recycle,Reduce,Reuse, Sewing, Tutorials, how to and tagged grocery tote, pillowcase tote tutorial, Sewing, tote, tutorial. Bookmark the permalink. Love your tutorial. Come visit my blog…All the way from Malaysia. I love ‘tutorials’!! I’m so glad I found you… how VAST this blogworld is! Your header inspired me without reading any further. It’s so bright and inviting. I’ve been making pillowcases but haven’t made anything from a pillowcase. Here’s my opportunity. I’ll close so I can go back and read your previous posts. That and a cuppa tea sounds good right now. Wow, how long did that tutorial take for you to photograph, set up, and post? You probably could have make half a dozen totes in that time, huh? :0) Thanks for taking all the effort, I’m off to the thrift store to search for… guess what? That’s great and thank you for sharing. I’m heading to the thrift store tomorrow to pick up some pc’s — they’re a buck each [Newmarket, Ontario, Canada :)]. I’ve bought them before to cut up for fabric for quilts, but never thought of using the pillowcase itself as the basis for a project – this is BRILLIANT!!! Thank you!! Wow! Wanted to make something interesting for Xmas. Now I have the sure thing. Thanks! I actually had the very same print on my sheets and pillow cases back in the 70’s! GROOVY!! This is awesome! I needed a quick and easy bag pattern for my teen group! Thank you SO much! OMIGOSH…I had to comment because I had those same sheets when I was a little girl!!! I found you from over at Scribbit…love your tutorials!! Fantastic. I can’t wait to have a go, I know I have some odd pillowcases here somewhere! Thanks so much for this tutorial. I made my first one today and it turned out great. I love it and will make lots. may put velcro on top for kids to use for fun. Thank you for this! My first tote has become my “shabby chic” purse and now I am about to make more! Pingback: Paper vs Plastic? Or Cotton vs Canvas? Thank you so much for the tutorial. I’ve already made two bags this morning and you can check my blog for photos. I had that very pillowcase, but in the blue colorway, back in the late 1960’s. How cool to see its twin on your tutorial! Ellen. many many beautiful.. you bag and the tutorial. I LOVE THIS SITE but this is the only thing I didn’t like when I made it I used it to carry my books to the public library, and when I put all my books in like 2 or 3 in it collapsed the seams ripped and it was a really big pillow that was strong. I am so excited about this project and for the one who commented that it wasn’t strong enough for library books, nearly everything isn’t strong enough for books unless it is canvas. You could do the interior in canvas if you wanted to. I wanted to let you know I have a pillowcase just like the one shown here. It is vintage made in about the sixties. I inheired my Aunt’s estate and there are so many pillowcases. Now I have something to do with them. Have you ever heard of a circle purse? That would be a good idea on this if the outside of your pillowcase didn’t look that good. I saw a small purse, it’s cloth, with a zipper, cloth straps, and cordinating fabric. First make the purse and then you put circles all over it sewing them on the front of the purse. The circles are with both sides together, then turn inside out and sew around the circle, sew onto purse. I have long made pillowcase dresses for my daughter. I’m kind sick of them, so now I can use my stock pile of pillowcases on grocery sacks. Great tutorial, I totally get it!!!! Great idea I have made a bunch of reusuable shopping bags out of pillowcases. I usually line my bags with a solid colored pillowcase to make it stronger I have never had a problem with them ripping. I been using my reusuable bags for over two years now and have received many complients on my bags. I have found some great pillowcases and sheets in the thrift stores to use in my bags. I actually have these pillowcases! *LOL* Love the suggestion–We bought a house from family that still had a lot of stuff in it, some of which was dozens of new and used pillowcases. I’m glad I haven’t sent them to the thrift store yet. Wonderful patterns! Thank you so much for your attention to details and the great pictures. I just found your website, looking for a pattern for fabric flowers. I’ll be back here often! Thanks! 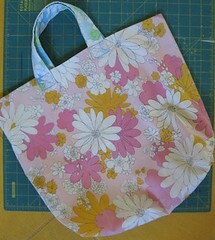 Pillow case tote tuturial is very easy to make. The instructions must be followed step by step to get a tote bag. Thanks for sharing this! 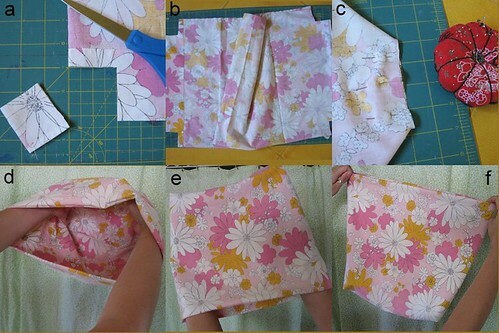 Great tutorial and a great way to reuse old pillowcases. I linked it at PassiFlora magazine (we have a post about reusable bags) http://passifloramag.com/2009/04/good-news/ I hope you do not mind. P.S. I was unable to get a picture of the final tote. Feel free to send me a copy and I’ll add it to the post. Oh my goodness! No way. You have the matching pillow cases to my thrift store find sheet that I turned into a summer duvet cover. Thank you for this great tutorial. Something I can actually sew! that was fun…but i had to laugh…i KNOW those sheets…we had them in blue too…lol…and im 58…ha! I adore thrifted pillowcases and I adore making bags…thanks for the tute! I love that they are lined, and so, reinforced. Perfect! I have already made quite a few from this tute. Thanks! Love your pillowcase tote…such a good idea!! Thanks for sharing! Great way to reuse your old pillowcase. Just wanted to thank you for the design, I JUST finished making this and it was a piece of cake! (I’m new at sewing). Anyway, thanks!! need help with steo C on the pc bag. The picture doesn’t really show what you need to do. Help Please!!!! The word “THESE” is a link for instructions. Make sure you click on that word for more info. I didn’t catch it the first time. Hi there!okay, I think i can understand everything except the first step. Which way do you fold the pillow case? It says long ways and cut off 3/4″ on one side? On just one side of the fold? Help, i love this and can make pillow case dresses, but this has me completely confused:). You sure do make som beautiful things I love looking at them thanks so much for sharing. I just made this and I love my new shopping bag! Now back to make some more with the pillowcases I just bought at Goodwill. I have this fabric ! Mine were sheets. I made a cover for my feather comforter.